Last week went so well, we have another list put together by Underground Bunker contributor Jeffrey Augustine. This time, he takes a look at Scientology’s propaganda magazine, Freedom, which has gone under a transformation lately. 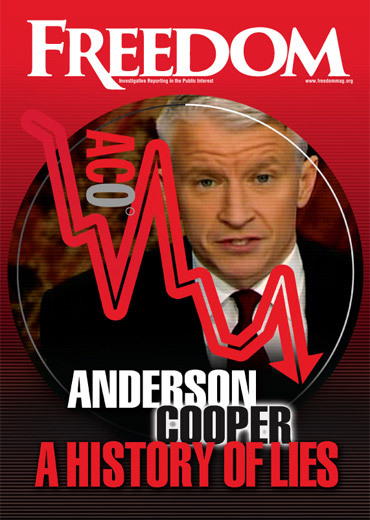 For several years, Freedom only came out every year or so, whenever Scientology leader David Miscavige had another target that needed tarring, whether it was the St. Petersburg Times, Anderson Cooper, or the New Yorker. Comical in their vitriol, these issues backfired badly on the church — we’ve talked to many former members who said reading one of these clownish publications was so startling and the magazine was so obviously filled with falsehoods, it made them begin to look for the first time for the real story outside Scientology and helped them begin their journeys back into the modern world. 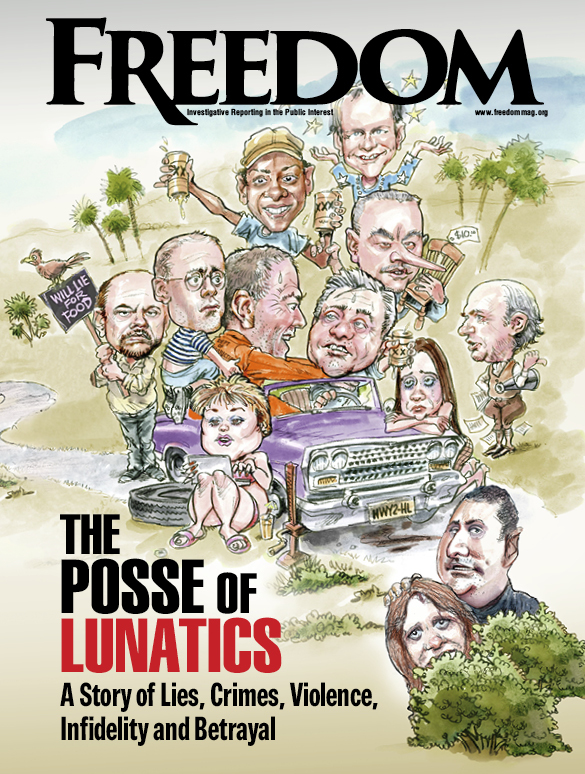 But after one of the goofiest issues ever, which featured a caricature of former church executive Mark “Marty” Rathbun and the rest of his “Posse of Lunatics,” the magazine went dark for more than a year. Then, in September 2013 we learned that it had hired a new editor. But John Sugg was apparently only going to run the “Florida edition” of the publication, and it became extremely dull, filled with Scientology’s fake concern about drugs and “human rights.” So much for Freedom, we thought. But then we noticed that a call had been made for editors and writers to staff up a newsroom in Los Angeles. What was Miscavige up to? With Alex Gibney’s documentary Going Clear on its way, was Scientology manning up for a major campaign against the film? Well, yes and no. We’ve seen that Scientology has used Freedom‘s website to post a campaign against the film, with inane smear videos and lots and lots of earnest lawyer letters. The Church of Scientology is an opposite world where black is white and up is down. One can be certain that the Church is doing the exact opposite of whatever it is publicly promoting. One need only read the latest online edition of Scientology’s propaganda organ Freedom magazine to see the hypocrisy. We’ve taken some recent Freedom headlines and contrast them with the facts. •	The Church routinely makes Scientologists sign bonds calling for penalties of $25,000 for violating confidentiality. •	Scientologists are made to sign a contract stating that they do not own their own pc folders and are not allowed to read their pc folders. •	Knowledge Reports – snitching on others – is a way of life inside Scientology. •	The Church does not open its books for financial inspection. •	The Church does not account for how it spends parishioner donations. •	David Miscavige is portrayed as a “global ecclesiastical leader” when he has never actually done any of the things real global ecclesiastical leaders do. For example, Miscavige has never been invited to address the United Nations; has never addressed the US Congress or any other elected political body; has never been photographed with any global political or religious leaders; has never funded and opened an orphanage, a hospital, or a university. Miscavige has appeared only on television twice — in 1992 on ABC’s Nightline with Ted Koppel and in a 1998 A&E interview. •	Scientology tells the public it is a religion, but tells its members it’s an exact science with the only explanations for the nature and origin of the universe. •	The Church still claims the Guardian’s Office was disbanded when the GO was simply morphed into Office of Special Affairs. Led by former GO Snow White Programs Op Linda Hamel, OSA is tasked with churning out a steady stream of Scientology propaganda and crafting a never-ending series of hateful websites against former Scientologists and critics. And like the GO, OSA has an unlimited budget to spy on former Church members, critics, and on persons of interest to David Miscavige. believe themselves to be Homo Novis, a master race superior in every way to humans. Fighting to know the facts in the Church of Scientology is a crime. •	Scientologists are not allowed to know what their donations are spent on. •	Scientologists can be severely punished for reading “critical websites” on the internet. •	New Scientologists are not allowed to know the contents of the OT Levels. •	Scientologists are not allowed to know the contents of their pc folders or Ethics folders. •	Scientologists are not allowed to know the real details of L. Ron Hubbard’s death. •	Scientologists are not allowed to know the real details of how David Miscavige took over the Church. •	Scientologists are strictly forbidden to talk about their case outside of session. No Scientologist is allowed to know how any other Scientologist is actually doing in session. Even husbands and wives are forbidden to talk to each other about their auditing. •	The Church of Scientology uses child labor and works children 80 to 100 hours per week or more. •	The Rehabilitation Project Force is a prison-like detention center whose inmates have no legal rights and are not allowed to speak to anyone except other prisoners. •	Sea Org members are treated as prisoners, live in guarded dormitories, and are guarded during their working hours to prevent their escape. •	The Church of Scientology engages in human trafficking. For example, the Scientology Sea Org recruits heavily in Eastern Europe for its labor force at Flag. Once overseas workers arrive at Flag, their passports are confiscated and they are heavily guarded as they are moved by bus from berthing to Flag. Aside from subsistence room and board, these workers are paid as little as possible, typically about forty cents per hour for working 100+ hour weeks. •	The Church of Scientology makes its members sign its infamous “kidnap contract” allowing the Church to kidnap and hold them against their will if they are deemed Type III, a term referring to a psychotic break. This is the same type of contract Scientology agents used to pull Lisa McPherson out of psychiatric hospitalization following her psychotic break on a Clearwater street in which she stripped her clothes off and asked passersby for help. •	The Church of Scientology operates “recovery teams” to hunt down and capture escaped Sea Org members. This headline is one of those “Scientology is lying again” moments. There is no privacy for anyone in the Church of Scientology. •	All auditing sessions are videotaped. •	All sec checks are videotaped. •	Sea Org berthing is subject to unannounced searches. •	David Miscavige and the Office of Special Affairs use tax-exempt dollars to spy on people, purchase phone records, and dig through trash. •	Pat Broeker was secretly spied on for twenty-five years at a cost of $12 million. •	David Miscavige spied on his own father for at least eighteen months at a cost of $10,000 per week (and probably a lot more). •	OSA rented a house to spy on the Marty and Monique Rathbun for three years, using hidden cameras. •	OSA’s main job is to continually gather information on Church members and Church critics alike. •	The Church of Scientology admitted to engaging in burglary and wiretapping in Operation Snow White. Here we were fussing over the fine points of Freedom’s coverage on eroding civil liberties, historic free trade agreements, and the impossibility of real public discourse — and all anyone is going to be talking about is the length of the royal baby’s eyelashes and the degree of slope on the royal baby’s nose. Hey, that’s cute. Of course, the editor of Freedom isn’t allowed to note that another subject has kept the public pretty fascinated over the last month or so — since, that is, Alex Gibney’s film Going Clear hit HBO and raised the public’s awareness of Scientology’s abuses and controversies like nothing before it. All anyone was talking about for a while was how Scientology bullied its way into tax exempt status and how Tom Cruise is a hell of lot creepier than anyone previously thought. But you’re not going to see Lankheim admit that. She’s got a pretend job to do. We didn’t get a chance to include photos in our book about Paulette Cooper, so we’re posting them here at the Underground Bunker on Friday. Nearly all of them have never been seen anywhere, and come from Paulette’s personal collection. We think you’ll find them a fascinating companion to the book. Copies of the paperback version of ‘The Unbreakable Miss Lovely’ are on sale at Amazon. The Kindle edition is available for pre-order, and will be delivered on May 14. 2:30 people start arriving to socialize on the patio. 3:00 Meeting begins. President says a few words, makes announcements and then the speakers are introduced. 4:15 Move to patio while the room is set up for dinner. Wine bar. Time for book sales. Hey, these folks go all out. We hope some of our readers can make it. We’ll have copies of the book to sell for a discounted price, and we’ll be signing them at the event.